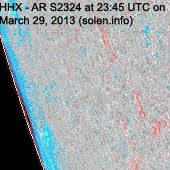 Last major update issued on March 31, 2013 at 06:00 UTC. 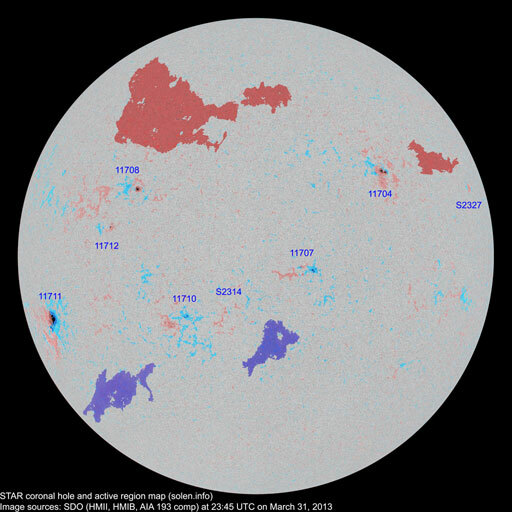 The geomagnetic field was quiet to minor storm on March 30. 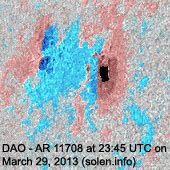 Solar wind speed at SOHO ranged between 476 and 568 km/s under the influence of a high speed stream from CH562. 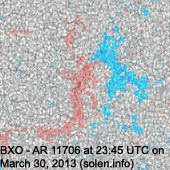 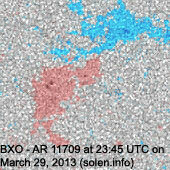 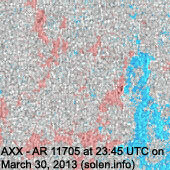 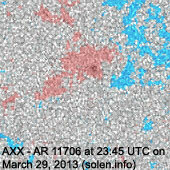 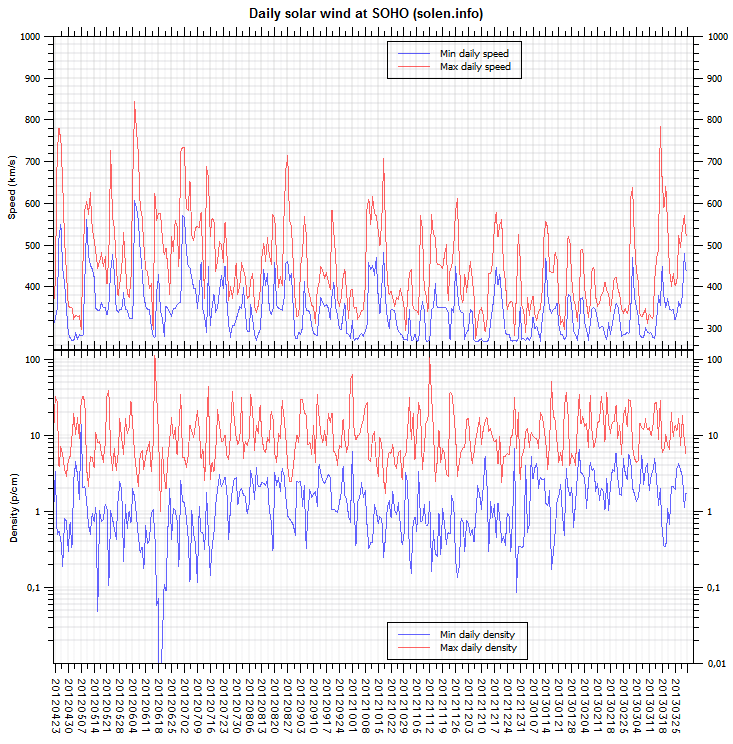 Solar flux measured at 20h UTC on 2.8 GHz was 108.4 (decreasing 3.6 over the last solar rotation). 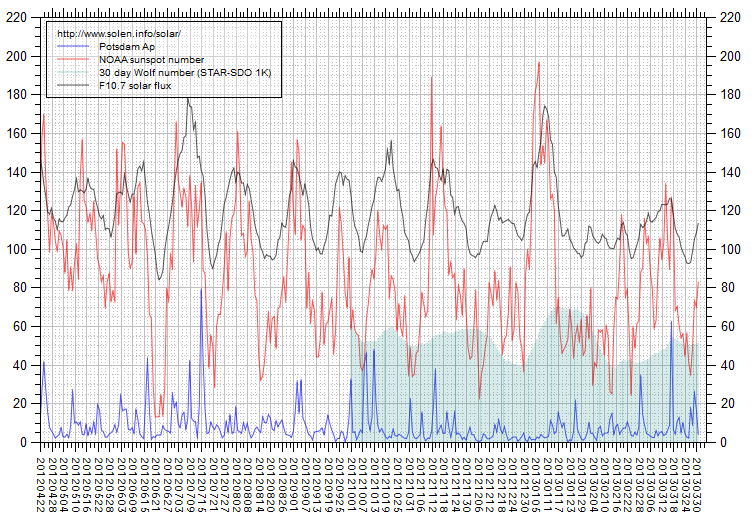 The Potsdam WDC planetary A index was 16 (STAR Ap - based on the mean of three hour interval ap indices: 16.5). 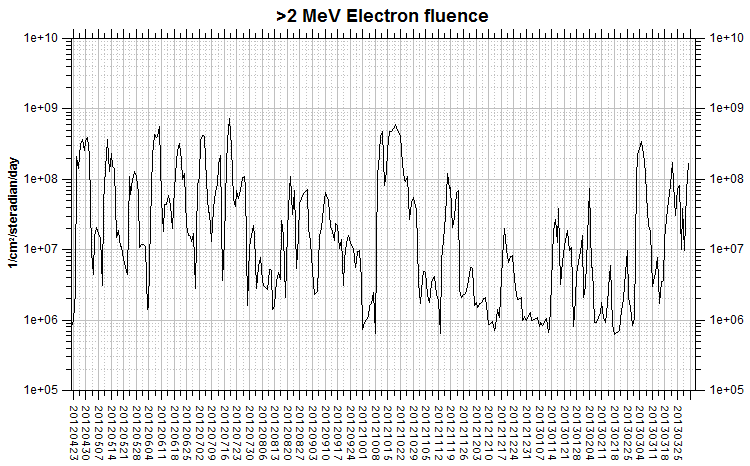 Three hour interval K indices: 55212132 (planetary), 54222231 (Boulder). 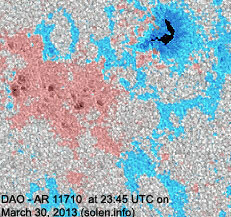 Region 11704 [N15W20] was quiet and stable. 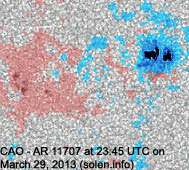 Region 11705 [S11W47] reemerged with a few spots. 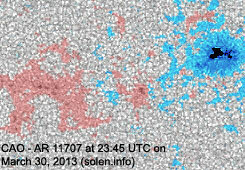 Region 11706 [S06W36] was quiet and stable. 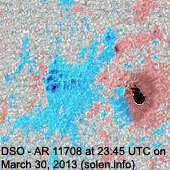 Region 11707 [S10E02] decayed slowly and quietly. 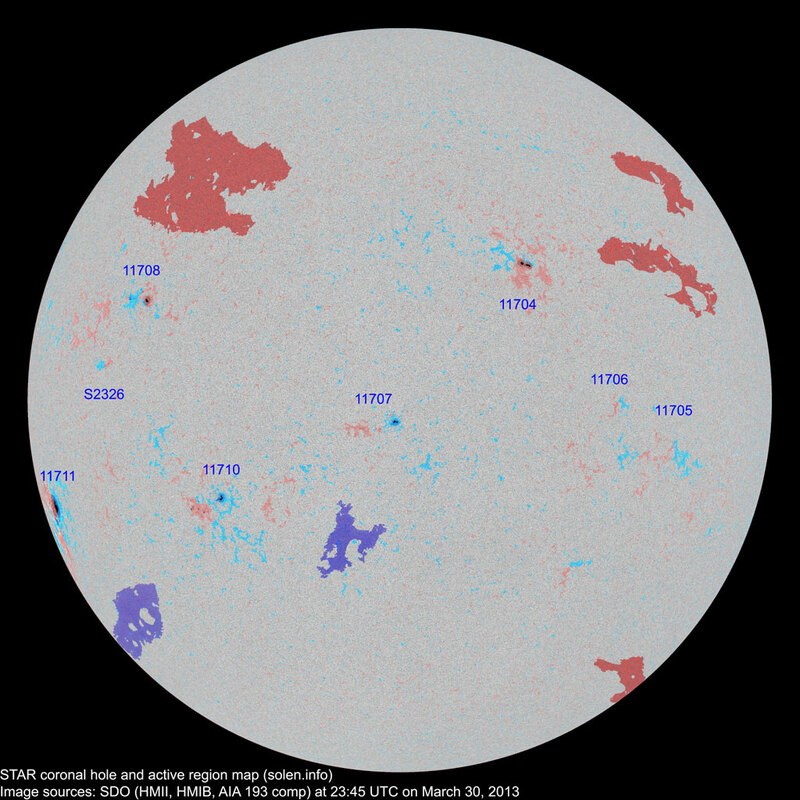 Region 11708 [N11E45] was quiet and stable. 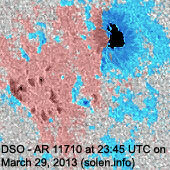 Region 11710 [S21E32] was quiet and stable. 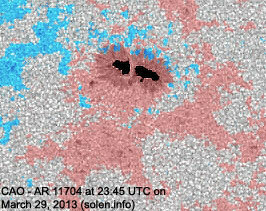 New region 11711 [S18E76] rotated fully into view. 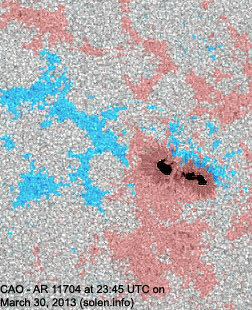 While the region was quiet, C and M class flares are possible. 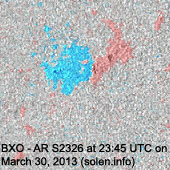 New region S2326 [N02E52] emerged with penumbra spots. 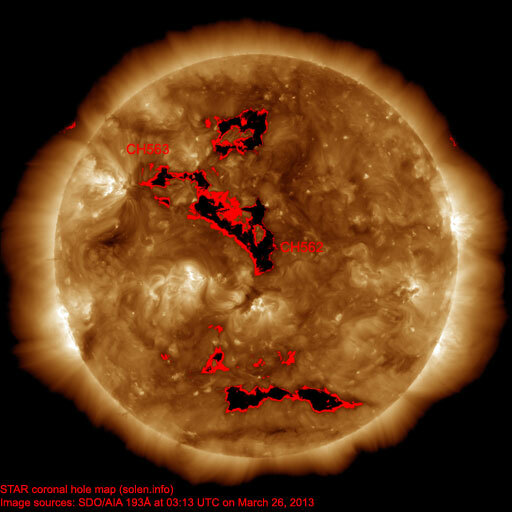 The geomagnetic field is expected to be quiet to unsettled on March 31 - April 1 due to effects from CH562/563 and quiet on April 2.